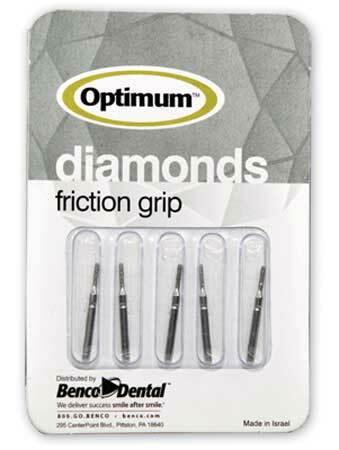 Optimum Diamond Burs offer clinicians multi-use, friction-grip bur designed to cut cooler and faster with maximum precision and minimum vibration. I had not used these diamond burs from Benco before. I had been primarily using another well known brand. I found these burs to be as good if not better. I try not to use the burs over and over again. I often buy one time use disposables. These burs seemed to stay sharp after three uses, if I only used them on tooth structure or minimal restoration removal. I would definitely purchase them if the price was right, or a major discount for a bulk buy.